this blog and involved in the wine industry as an award winning commercial winemaker. Passionate about wines, especially of the “non-grape” variety. With over 20 years experience in the wine industry, Dominic has been passionately interested in wine since the age of 17 when he started making wine from local fruits and grapes in Canada. After becoming a qualified sommelier, he studied advanced winemaking and oenology and undertook and passed the Wine and Spirit Education Trust (WSET) Higher Certificate with distinctions. He is now studying towards the prestigious Master of Wine accreditation. He is a founding director of the Fruit Wines of Canada Association, which was involved in promoting wines and its industry throughout Canada. Dominic has won hundreds of awards and medals in national and international wine competitions. This has included the best dessert wine in Canada in 2007, best wine in B.C. in 2008, various best of show awards in fruit wine and desert wine categories, plus best fruit wine in Canada in 2010 and numerous distinctive awards since then. Over the last decade, Dominic has been busy running numerous wine production and exportation projects with wineries and wine importers/distributors in Canada, USA, Italy, Spain, Chile, Taiwan, Korea, India, Japan as well as China. He he is a speaker on the subject of winemaking and wine marketing at various symposiums throughout the world. 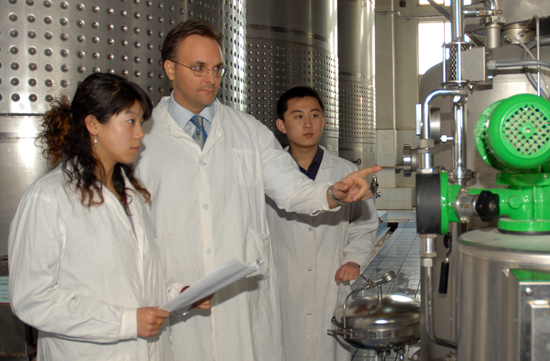 In Canada, Dominic has been engaged in R&D projects for the government of Alberta and New Brunswick and has perfected numerous dessert wine production techniques including iced fruit wine cryo-extraction. He specializes in cider, fruit wine, dessert wine and ice wine production and is known in wine industry circles as an authority in fruit wine making. Dominic is active in the burgeoning Chinese wine industry as consultant winemaker, wine judge with the China Fruit Wine Association as well as Chief Winemaker and for Tonghua Winery, the fourth largest winery in Asia, situated in North East China. Dominic has also been involved in running the wine production of a high quality tropical fruit winery in Thailand and the research and development of wines and other alcoholic beverages using tropical fruits and herbs. Presently, Dominic is based out of Nova Scotia, Canada and has taken up sustainable and organic fruit growing, is an active speaker at wine symposiums throughout the world and continuing to assist wineries with their wine production on a consultant basis. He is enthusiastic about the developments in the fruit wine industry and its great potential not only locally but on a global basis. Dominic is available for on-site consultation or off-site assistance via phone, email or video consultation. – Anything else needed to get your wine project going!